A classic chicken pasta, this delicious chicken piccata angel hair is my go-to dinner for any hectic weeknight as it comes around super-quick and satiate both my body and soul! Pastas have become a part of our life! Even after not being an Indian staple, pasta has made its permanent place in our everyday meals! Every now & then I keep experimenting with this global food which is originally an amazing contribution of the food-loving country Italy. I am sure you are aware of all these fact, but I could not hold myself from this self-satisfying blabber! 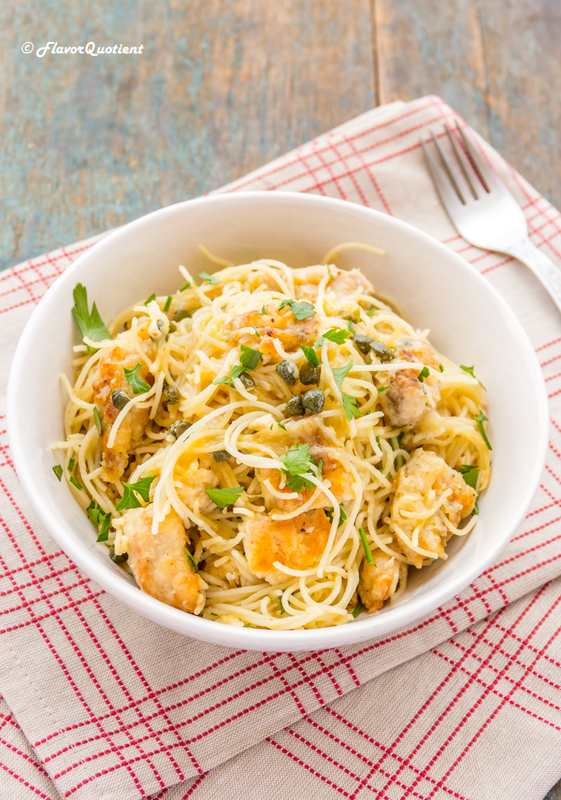 Today’s recipe – chicken piccata angel hair pasta – is one such recipe which makes you fall in love with pastas all over again! Angel hair pasta, also traditionally known as capellini, is hands-down my favorite pasta of all time. The thin strands of capellini, especially in this chicken piccata sauce, reminds me of noodles and most probably that’s the real reason for my intense love towards this pasta. Chicken piccata is a traditional Italian chicken recipe made with lemon-wine sauce with a thick creamy base and have got a kick from the tangy capers. A substantially easy recipe with right balance of flavors, this chicken piccata complements perfectly the thin angel hair pasta. The crispy cubes of chicken breasts are added bonus and makes it a super-satisfying one-pot meal. Chicken pasta is my favorite genre of pastas which you can clearly make out from the number of chicken pasta recipes we have here at Flavor Quotient. Chicken with pasta offers the best of both worlds – protein & carb – and makes super-quick and super-tasty meal which is exactly what you look for on a weeknight! 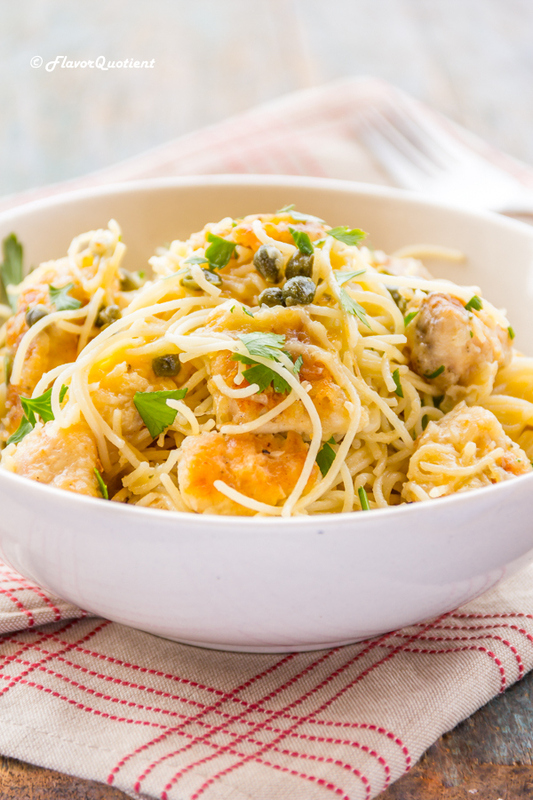 And with this recipe of delicious pasta with chicken piccata, you have one more firearm in your arsenal! This year has brought about a lot of changes in my personal and professional life. When I realized that almost half of the year is over, I could not help but reflect on the drastic changes that have shaped and still shaping my life into new mold. I have no complains and no regrets. I welcome any change in life, even though it’s little overwhelming in the beginning; but things settle down with time and our brain and soul adapts to the new phase. The major change is the change of job which has brought in significant impact on my daily routine. Since I truly believe that change is the only constant in life, I have embraced this new phase with utmost vigor and enthusiasm, which is surprisingly making me happy in turn and help me feel much more content and satisfied than ever before. Because of the new routine, I need to keep my meal plan chalked out and ready before the start of the week. When you have a hectic week before you, what’s the best thing to look for to keep you sorted as well as your tummy full? 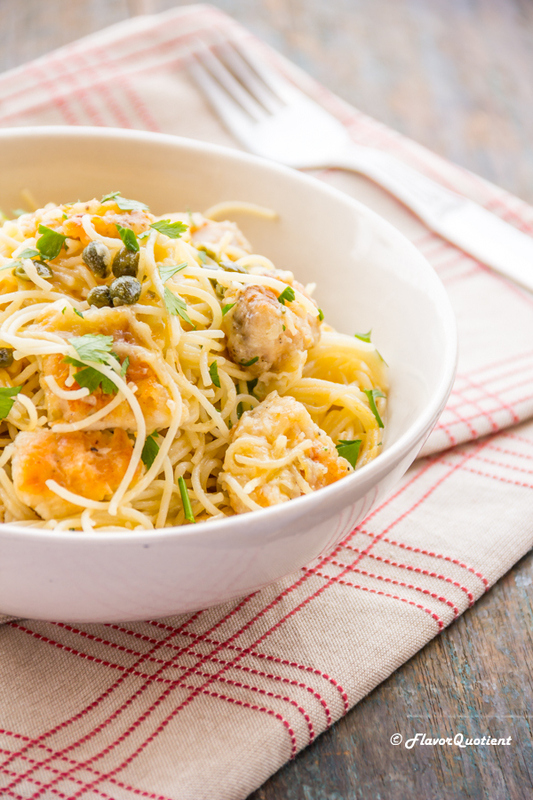 An easy yet tasty recipe like this chicken piccata angel hair pasta. This pasta will still be a rocking one even if you omit the chicken from it. The lemon-wine sauce is very addictive on its own and coats each strand of pasta with its awesomeness. If you are a seafood lover, then don’t miss this delicious shrimp scampi with capellini which was immensely loved by all my readers. 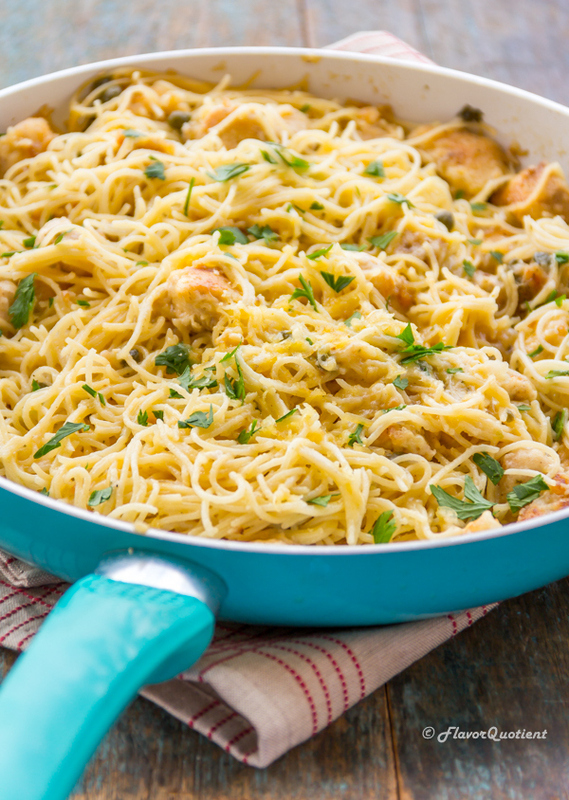 I am sure this chicken piccata angel hair will become your favorite pasta too and will help make pasta a permanent place in your family menu! Cook the angel hair pasta in salted boiling water as per the packet instructions until al-dente. This pasta is very thin, hence cooks very quickly; so keep an eye! Then drain the pasta and set aside. Cut chicken breasts into small bite-size pieces and take them in a bowl. Season the chicken with salt & pepper and add the flour. Mix well using a spatula to uniformly coat each chicken piece. Heat 1 tablespoon of butter in a skillet and add about 1 tablespoon of olive oil to it. Once the oil is hot, add the floured chicken cubes and sauté them until golden brown on all sides. Then take them out and set aside. Add remaining butter to the same skillet and once melted, add the minced garlic to it. Sauté the garlic for couple of minutes until fragrant. Then add white wine, lemon juice, chicken broth, capers and heavy cream. Mix everything well and then add the sautéed chicken cubes. Stir them in to coat with the sauce. Next add the cooked angel hair pasta and toss them in the sauce using a tong. Finally add the grated cheddar cheese and give a final mix to let the cheese melt. Garnish the chicken piccata pasta with fresh parsley and serve it warm. Enjoy! Hey, Fantastic recipe i tried it and it works. Thanks for sharing.